Birmingham City Hall is located at 710 20th Street North, Birmingham, AL 35203; phone: 205-254-2000. Photo: Arlington (also known as the Mudd-Munger House), ca. 1845, 331 Cotton Avenue, SW, Birmingham, AL. Former plantation house built by William S. Mudd. 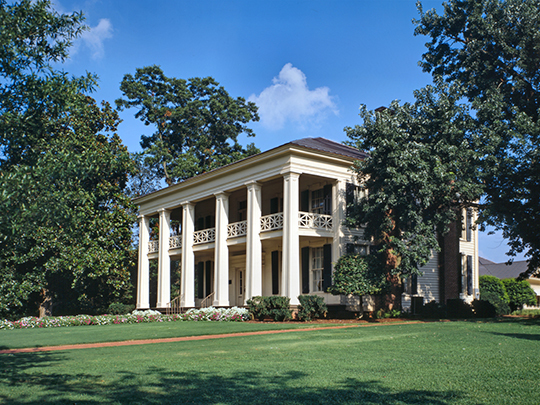 This is Birmingham's only antebellum mansion. Listed on the National Register of Historic Places in 1970. Photographed by Jack E. Boucher, 1999, Historic American Buildings Survey [HABS AL-424], memory.loc.gov, accessed July, 2013. Many of Birmingham's neighborhoods originated as separate small towns. Like the city center, these neighborhoods are typically characterized by a grid of connected streets for easy walking, small to medium sized house lots, houses that face the street, small blocks, human-scaled commercial districts, and, in some cases, neighborhood parks. Neighborhoods built from the 1960s on have a more suburban character with winding streets and bigger blocks, and varying densities—for example, tightly platted subdivisions surrounded by vacant land, multifamily enclaves, or subdivisions on golf courses. These newer developments typically lack sidewalks, parks, and neighborhood centers. Birmingham residents who participated in the planning process, including those who prefer to live in the more suburban-style neighborhoods, made it clear that they desire more walkability and connectivity. Regulatory frameworks that emphasize the relationship of buildings to the street and the public realm can enhance walkability. The Progressive Era in Birmingham, Alabama: 1880-1929 is part of the context of a multiple resource submission  listed on the National Register of Historic Places in 1990. Portions of the text below were adapted from a copy of the original nomination document. Adaptation copyright © 2011, The Gombach Group. The City of Birmingham was planned several years before the city was actually founded. In 1869, a group of investors and promoters of the North and South Railroad Company met in Montgomery, Alabama, to form the Elyton Land Company. The purpose of this newly formed company was to establish an industrial town or "work station" near the rich iron, coal, and limestone deposits of Jefferson County. The Elyton Land Company purchased 4,150 acres of farmland in Jefferson County, including an area known as Jones Valley, the site of present day Birmingham. Jones Valley, measuring approximately five miles wide and fifteen miles long, is one of the southernmost valleys in the great Appalachian Mountain chain. Surrounded on both sides by Red Mountain, the valley had unusually rich deposits of iron, coal, and limestone. The area was identified as early as the 1830s as a potentially important industrial site, but the lack of adequate transportation across the surrounding mountains kept the area isolated and unproductive. Railroad service through the area had begun by two separate railroad companies in the early 1860s but was halted due to the Civil War. By 1870 the Alabama and Chattanooga line was completed; running northeast to southwest through the county, connecting Chattanooga with Meridian, Mississippi. The North and South railroad line ran north to south, connecting Nashville to Montgomery. The two railroad lines intersected in the center of Jones Valley at the site of the proposed new industrial city owned by the Elyton Land Company. In 1870, the Elyton Land Company surveyed the valley and mapped out the plans for the new industrial city. The city was laid out on the grid plan, with the streets running on the northeast to southwest axis following the existing railroad tracks. The Elyton Land Company promoted the area as the new industrial center in the state and actively tried to attract settlers to Birmingham. The Land Company began to sell lots in June of 1871, and by the end of the year more than 100 houses and stores had sprung up and the population was over 800 inhabitants during this early boom period. Birmingham was incorporated by the state legislature in December 1871. The city charter provided for a mayor elected at large and a board of aldermen elected from wards. The city leaders continued promoting the merits of the area and eventually were able to have the Jefferson County Courthouse moved to Birmingham. It was boosted that Birmingham's population increased to nearly 4,000. Although the area had a great wealth of iron deposits, the industrial development envisioned by the Elyton Land Company did not develop. A nationwide depression in 1873 and a local cholera epidemic abruptly ended the speculative boom in Birmingham. For the next eight years Birmingham experienced no industrial development or population increase. Under new management, the Elyton Land Company concentrated less on attracting settlers to Birmingham and more on trying to develop the coal and iron resources. In 1876 the Elyton Land Company and the Louisville and Nashville Railroad Company undertook a joint venture to start an experimental furnace. For the first time pig iron was produced from Alabama coke. During the next ten years Birmingham experienced an amazing period of industrial growth and development as existing companies expanded and new Northern capitol streamed into Birmingham. In 1882 James Sloss purchased 50 acres of land and built the Sloss Furnace, the largest blast furnace in the area. In the following year, the capacity of Sloss was doubled by the erection of a second furnace. In 1885 the Williamson Furnace was constructed. The Woodward Iron Company completed its first furnace in 1888. Construction of blast furnaces also developed in neighboring communities of Ensley, Thomas, and Bessemer. Other iron-related industries also developed in Birmingham, such as rolling mills, foundries, and iron pipe factories. In the mid-1880s and the early 1900s two events of great importance occurred which greatly changed the iron and coal industry in Birmingham. The Tennessee Coal, Iron and Railroad Company (T.C.I.) bought almost every independent coal and pig iron producer in the Birmingham area. The T.C.I, purchased the properties of the Alice Furnace Company, the Pratt Coal, Iron and Land Company, and the Linn Iron Works. Within several more years T.C.I, also purchased the DeBardeleden Coal and Iron Company and the Cahaba Coal Company, and large bodies of coal mines. The few remaining companies merged to form three major corporations. During this period T.C.I, greatly expanded iron production in the Birmingham district. The second important event occurred in November of 1907. The United States Steel Corporation, America's largest steel company, bought all of the T.C.I, stock during a financial panic. U.S. Steel immediately began rebuilding and expanding the T.C.I, plants and equipment, inaugurating new methods, and increasing efficiency and production. During the next 20 years, U.S. Steel invested one hundred million dollars in T.C.I. Alabama steel production continued to grow, from 320,000 tons in 1907 to 530,000 tons in 1910 and 1,225,000 tons in 1916. Although Birmingham could still produce steel at considerably lower cost than Pittsburgh, U.S. Steel raised the price of Birmingham steel to the same level as steel produced in the company's older and larger Pittsburgh plants. After the purchase of the Birmingham steel mills by U.S. Steel, the Birmingham district was no longer in direct competition with the Pittsburgh mills. Although production continued to be high through the 1920s, no new steel companies or steel entrepreneurs settled in Birmingham. The boom days of competitive speculation were over. With the depression of 1929, furnaces and mines were shut. The city's accelerated pace came to a halt and very few buildings were constructed in Birmingham between 1929 and 1946. The production of pig iron which catapulted Birmingham to a major industrial center was also responsible for Birmingham's staggering population increase during the same period. Several years after the formation of the city, Birmingham's population was around eight hundred. In 1880, the city population was over three thousand and by 1890 the population increased 748% to twenty-six thousand. In addition, the 1890 population also included an additional twenty thousand people living in urbanized areas outside the city limits. The 1900 population of the city was thirty-eight thousand people and an additional forty thousand living in the nearby suburbs. By the turn of the century, Birmingham was surrounded on the northeast and west by dozens of small suburban communities that were developed by land speculators to accommodate the city's growing population. The introduction of the street car opened up the city's surrounding countryside for real estate development and speculation. Highland Park and Avondale, the city's first suburban residential communities, were developed east of Birmingham for the city's leading merchants and businessmen. Soon, other suburban developments sprang up along the street car lines; such as East Birmingham, Woodlawn, and East Lake. To the west of the city near the new steel factories working-class suburban developments appeared, such as Elyton, West End, Smithfield, Owenton, Ensley, Thomas, Pratt City, and Wylam. In 1910, Birmingham annexed many of these suburban communities, increasing the size of the city by forty-eight square miles. The city's 1910 population was 132,685, with sixty thousand in the original city limits and seventy thousand in the new expanded area. Birmingham's population began to level off by 1920 with a population of 178,806. Birmingham was advertised as the fastest growing city in the south, and the largest city of its age. Since the founding of Birmingham in the 1870s, city residents have enjoyed superior services and utilities provided by private companies and by the city government. The Elyton Land Company furnished the newly created city with its first water system. Initially the water came from a nearby creek, but its resources were not sufficient for the rapidly growing city. The water was then diverted from a spring located six miles to the north. The spring water traveled by gravity through canals and aqueducts to a pumping station in Birmingham. Water came to Birmingham at the rate of five million gallons per day. At this time, over five hundred fire hydrants were installed throughout the city. In 1880, the Birmingham Gas and Illumination Company was incorporated. This was one of the earliest public utility companies in Birmingham and the first not controlled by the Elyton Land Company. The gas company was contracted by the city to supply the city with "gas, gas lights, electric lights or other illumination works." The company laid the lines and provided 20 street lamps. In 1886 the gas company merged with another company to provide electric lights to the city residents. The telephone, invented in 1876, was first used in private lines in Birmingham in 1879. The Pratt Coal and Coke Company strung up a line between its two offices. In 1882 the first Bell telephone exchange was established in Birmingham. The city of Birmingham was also responsible for providing many of the essential services to its residents. The city's early operational budget was divided into three distinct categories: education, services to persons, and services to property. The city was responsible for the education of the city's youth, hiring faculty and staff, maintaining school buildings and furniture. Services to persons included providing health assistance; maintaining city-owned charities, hospitals, and prisons; libraries; and recreation facilities. City of Birmingham Alabama, Comprehensive Plan: People, Prosperity, Place, Partnership, Performance, 2012, www.birmingham.gov, accessed November, 2015. Pamela Sterne King, Five Points South Apartment Improvement Program and Steven Kay, Alabama Historical Commission, Historic Fire Stations of the City of Birmingham, Alabama: 1906-1929, nomination document, 1990, National Park Service, National Register of Historic Places, Washington, D.C.